One might expect to struggle to find a Z, but if one heads to the Orient, one finds a plethora of deities which we transliterate with a Z. The Chinese Celestial Bureaucracy has a thousand servants – many of whom are deified humans – so their names resemble those of mortals. From General Zhao Yun, to Emperor Zi Ying, to Philosopher Zheng Xuan – anyone of sufficient greatness can claim a place in the Jade Court of Heaven. This proliferation does lead to over specialisation – many new deities are the Tut-ti, whose realm is small – particular villages, streets, or even individual houses. 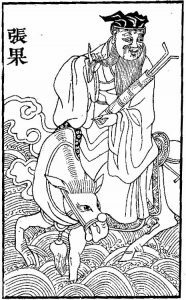 Greater souls (particularly those of Emperors) can govern larger realms – Yu the great, founder of the Xia dynasty is a water deity, and protector of ships at sea. I’ve chosen a story from the most eccentric of the Eight Immortals of the Taoist pantheon. As usual, I’ve switched about details to read better, and here I’ve introduced an element from a different story. Now, wandering in mountains whilst drunk is dangerous, and sure enough, Zhang fell. He tumbled down the mountain. He should have died from such a fall, and when he landed at the bottom, he realised he had consumed one of the Mushrooms of Immortality. The Emperor, on hearing of the wise teachings of this philosopher, summoned him to Luoyang, to be the chief of the Imperial Academy. The necromancer Ye Fashan, whose opinion was valued at court, came to the Emperor and warned against the appointment. “If I were to reveal the truth to Your Majesty, I would drop down dead of the malice of him” said the cunning necromancer. So the necromancer proclaimed Zhang to be a white bat, spun out of Chaos. And as he had said, such a truth was not for mortal lips, and he fell down dead. The Emperor, being not quite mortal himself, knew that this meant that Zhang was a member of the Celestial Bureaucracy. So the Emperor went to Zhang and begged forgiveness for Ye. And Zhang came to the court, and poured water over Ye’s corpse, which rose to life again. Soon after, Zhang fell ill and returned to his home on Zhongtiao Mountain. He remained still for three days, and his followers built a tomb for him. But on the anniversary of his seeming death, his tomb was opened for the people to pay homage to him, but the body had gone. No one knows where he went, but there have ever since been stories in that area, of folk who met the great philosopher, and benefited from his wisdom. In your Games and Stories. The Jade Court is intensely political, and an ideal backdrop for stories where quid-pro-quo is the order of the day.The various small goods, philosophers and courtiers are all trying to progress through the Hierarchy, and might well trade favours with protagonists. Or antagonists, for that matter. Because of the profusion of small gods in the Bureaucracy, Zhang is marked as “patron of the elderly”. This tells us something about Chinese society – that they consider the aged to be worth protecting. One has to wonder what other specialists the Jade Court harbours – and what counterparts wander the Thousand Hells. Zhang isn’t terribly powerful on his own, and is unlikely to feature in shrines or temples. His tomb might be intriguing to explore – how did he pull off the vanishing trick? – but would be unlikely to be full of easily looted treasure. Likewise, as a spell-granter, Zhang is likely to need to borrow from other bureaucrats – so would likely favour a spell of trade. Best example is Empire LRP’s Scales of Ephisis – Put something in the box, receive something of equal value, for a given idea of value. So that’s twenty-six gods, and a festival. If your clerical character can’t find someone to follow, you’re just going to have to write your own god. Or pantheon. And a world for them to inhabit. We’re hoping to write a book, with just such world-building help – with a bit more anthropological viewpoint, where here we’ve concentration on story-building. I’ve enjoyed sharing the stories of these gods with you, but now I’m going to hand off the blog to Amy, who plans to provide you with more monsters than you could shake a really big stick at. Do we make monster-shaking sticks, Boss? Unfortunately not. We do have a nice selection of other items however, along with an ongoing series of worldbuilding works by the name of Jigsaw Fantasy.